A game about the last tree on the planet. A retro arcade game about Walter's job. A caveman named "Ugruk" was wandering around looking for food. After searching for a long time, he finally found a huge hunk of meat! He ran straight to it, only to find out that it was a trap set by other cavemen. Ugruk fell into a deep pit and waited for his doom as he watched the cavemen jump down into the pit to try to kill him. Now, Ugruk must defend himself so he could get out of the pit and get his hunk of meat! Ugruk is a game from the one-room RPG game jam. 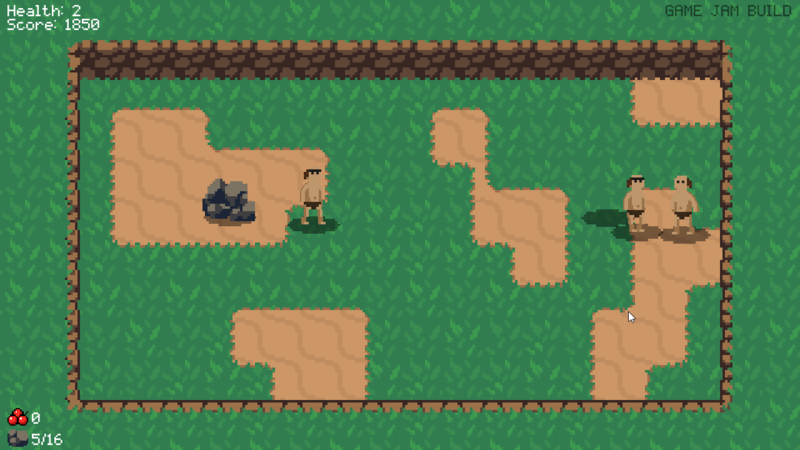 Ugruk is a game where the player must fight waves of cavemen without dying. Currently, there is only one mode which is the arcade mode. The arcade mode is endless and uses a scoring system. The planned story mode will have proper waves and will build up to stronger cavemen to fight. This mode is planned for the full release of the game. To learn more about the game and/or download the game, please click here to visit the game's page. Thank you for checking out my game! For my game, I want to make an action RPG. For the inventory system, how complex does it have to be? In my case, I was going to have it so number keys would be for your melee weapon, another for your projectile weapon, and another for your potions or whatever. These weapons could be swapped out whenever you gain a better weapon. Then, crafting items would just be stored as a variable to be used for crafting certain things, but you wouldn't be able to manage the items inside of a GUI. Would something along those lines be acceptable, or would it have to be more in depth? I would love it if you could play my latest game called Harambe Ruins! Send me the video when you make it too. I would love to see it.